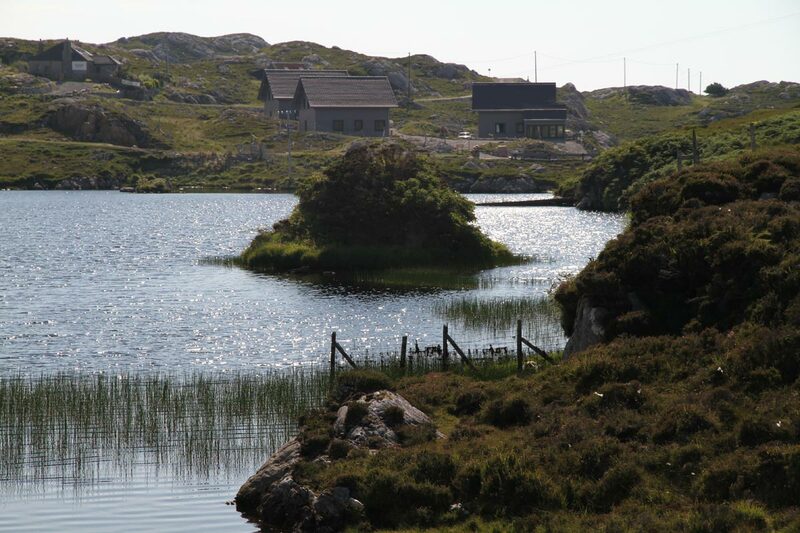 On this beautiful island we have built three timber-framed houses near the site of the old Finsbay Sporting Lodge. Much thought was put into both the construction and the siting of these houses. They are in a wonderful situation on the south east coast of the Isle of Harris, overlooking the river running into Loch Finsbay. 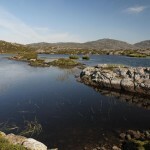 The loch abounds with seals and the occasional otter, and the river is used by migrating salmon and seatrout. In all it is a very peaceful and wonderful situation, framed by the backdrop of the spectacular Harris hills. 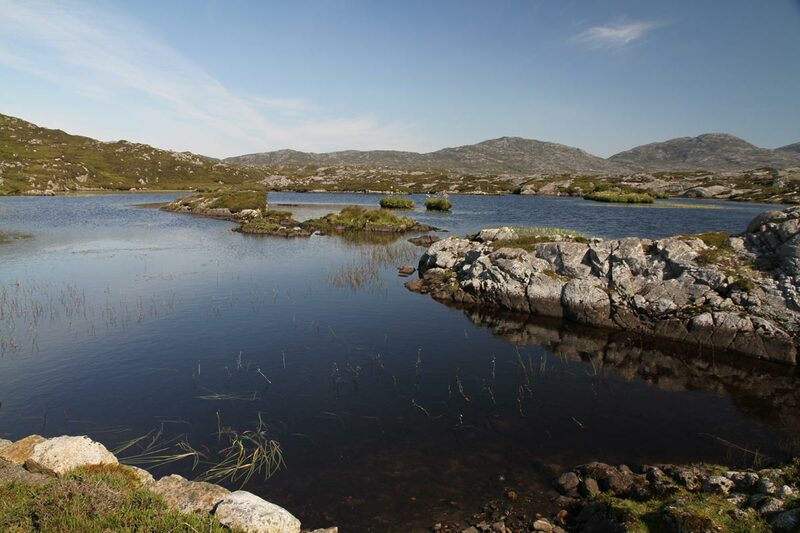 The lochs lie in a base of rugged, weathered granite and Lewisian Gneiss one of the oldest rocks in the world. The grass is sparse and the gazing poor, but there is an abundance of heather on the damp, peaty ground; peat is still cut for fuel on the island, and the scars of the peat beds are visible. There are large numbers of sheep with their close grazing habits, makes the growing of trees difficult but, where the sheep cannot reach them, there are occasional rowan trees. In some places tree planting has taken place, so please take particular care when crossing the fences protecting these areas. This is especially important at Loch Flodabay. The fauna on the island is varied, eagles and buzzards on the hill and seals and otters along the shore. Most of the red deer have now left South Harris but you may be lucky enough to see one of these in North Harris, or even some shy moorhen which are still in evidence despite their continuing persecution by mink released on the island some 40 years ago. These mink do damage to fish stocks and bird life and the island now employs a professional mink trapper in an effort to contain numbers. 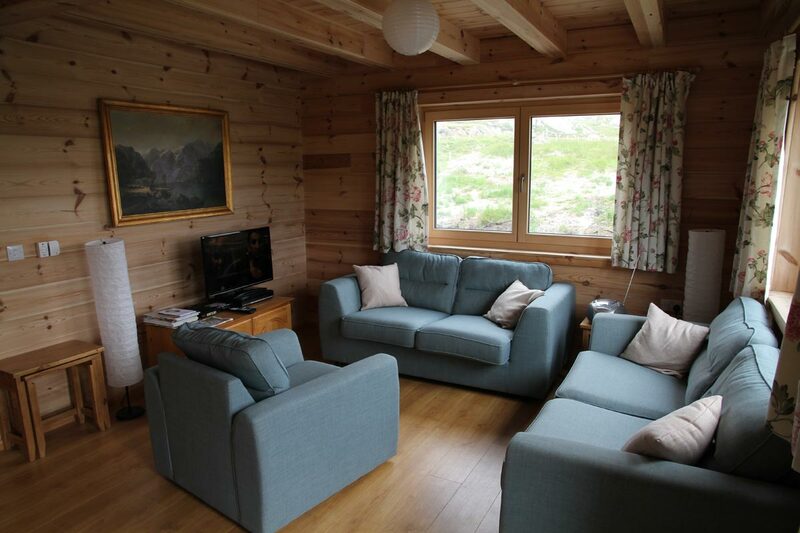 Arran House has the highest position of the three self-catering houses. 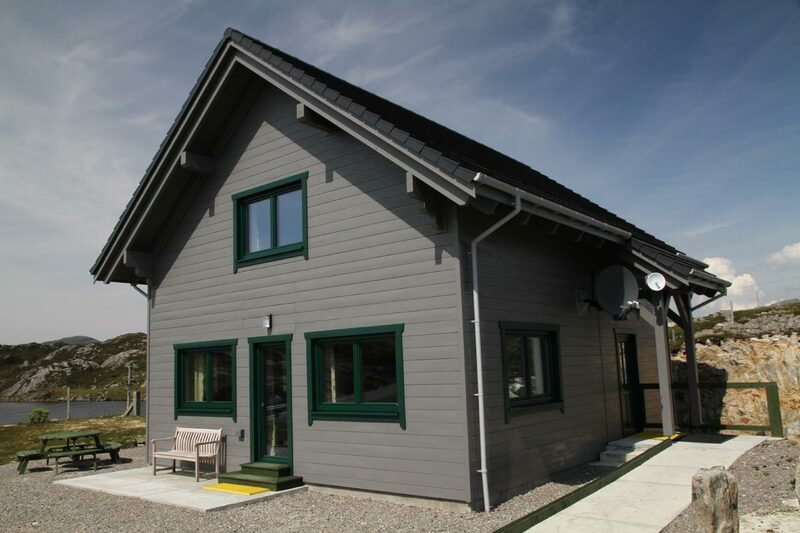 It is a quiet and peaceful house with wonderful views looking over the river estuary and to the sea-loch at Finsbay. 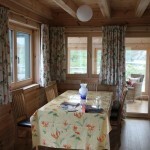 The timber-clad house is built with every comfort to make your holiday as comfortable as possible. Open plan kitchen/ dining room/ living room. 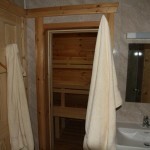 Twin bedroom with adjoining wet room with shower and toilet (suitable for disabled people) and sauna. Spacious master bedroom with adjoining family bathroom. Further en-suite twin bedroom. Rooms are bright and tastefully furnished. The house has Internet connection, underfloor heating, and TV in every bedroom. It also has disabled access, garden furniture, and car parking. 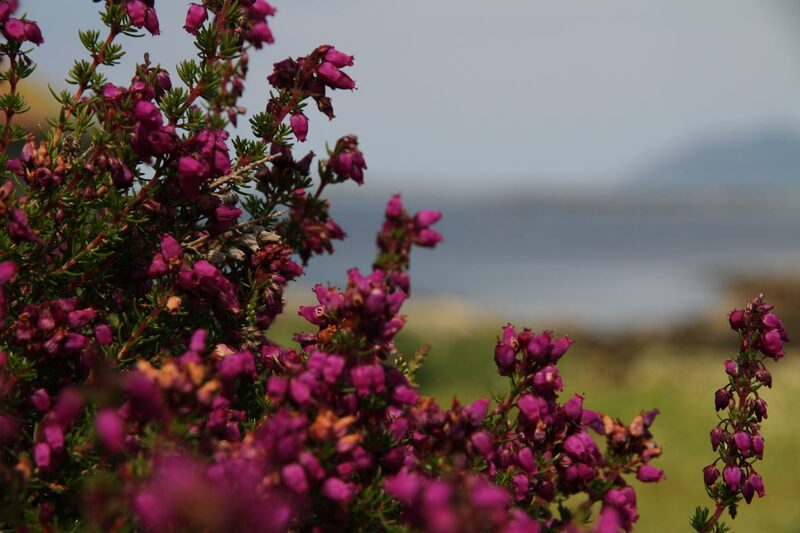 Coll House has views of the nearby freshwater lochs, the hills, the sea, and the river mouth where seals can often be seen playing. 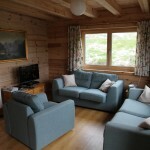 The timber-clad house is built with every comfort to make your holiday as comfortable as possible. 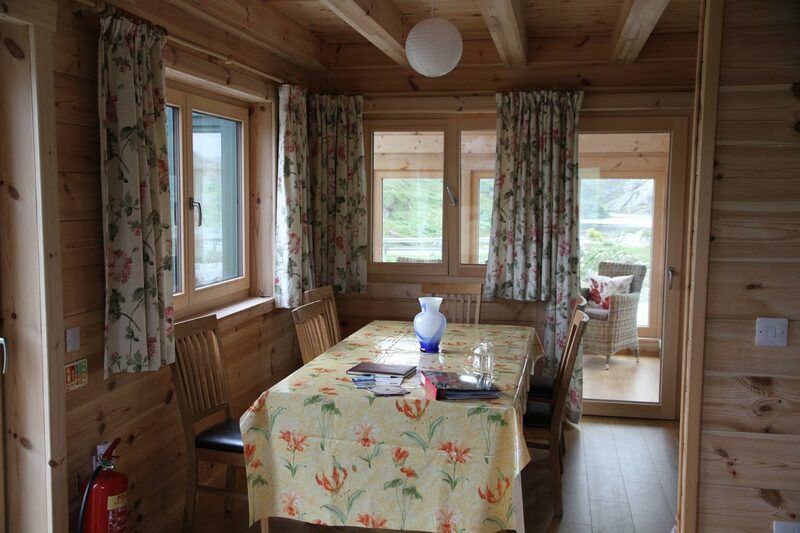 This newly built wooden-clad Self-Catering house is especially designed for your comfort and for a peaceful holiday. From your window you can see the river and the estuary where you have the opportunity to watch incoming migratory fish, and often seals and otters at play. The living room is connected to the dining room/kitchen and conservatory. 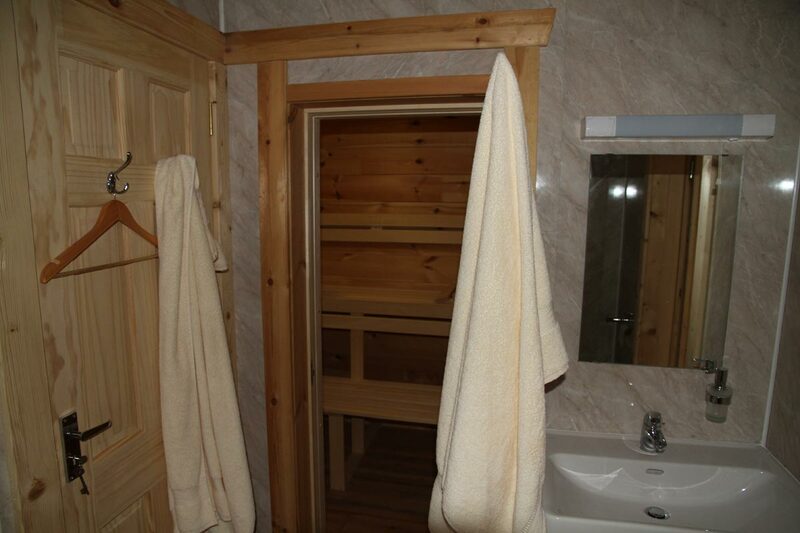 Twin bedroom with adjoining wet room with shower and toilet (suitable for disabled people) and sauna. 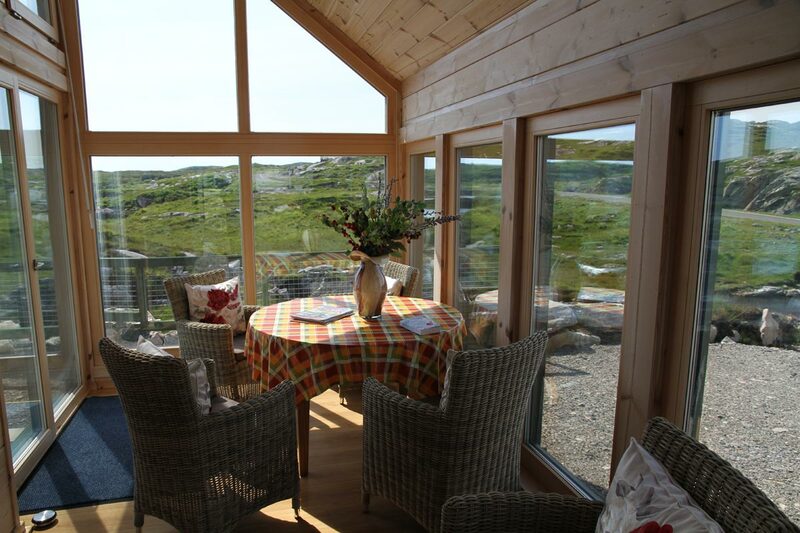 Cliff Cottage is a detached cottage situated on the east coast of South Harris on Loch Beacrevic, between the road and the sea. It stands on the left hand side of the road as you head south towards Rodel, about 400 metres beyond the old mill (at Geocrab), which is now a fish farm. The distance between Two Water Lodge and Cliff Cottage is little more than two miles. 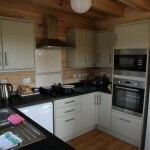 The kitchen contains: electric cooker, fridge, freezer, dishwasher, washing machine/tumble dryer. Sitting/dining room with kitchen area. Twin bedroom. Bathroom with bath, shower, whb, wc. 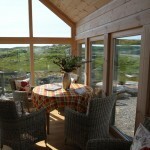 Two twin bedrooms with velux windows and views to the front and Loch Geocrab. Linen supplied. Heating by electricity, which is included in the rent. A travel cot is available on request. Broadband connection is available if required for personal laptops. Please contact prior to arrival. Dogs are welcome at Cliff Cottage as long as they are kept under control, please remember this especially during the spring before and after the sheep have lambed. We also ask that dogs are not allowed on to the furniture. 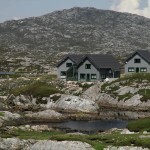 Two Water Lodge is a detached bungalow situated at the southern end of Stockinish, which is on the East coast of South Harris, just beside Loch Stockinish (Bay of Stockinish). 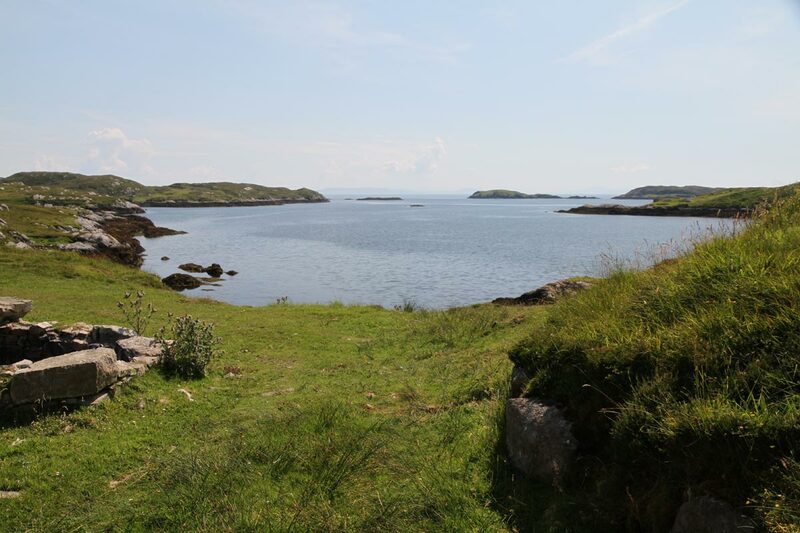 Travelling south towards Rodel, approximately 10 miles from Tarbert, the house stands on its own, approximately 30 metres off the road on the left hand side with a stone walled entry in to the garden. 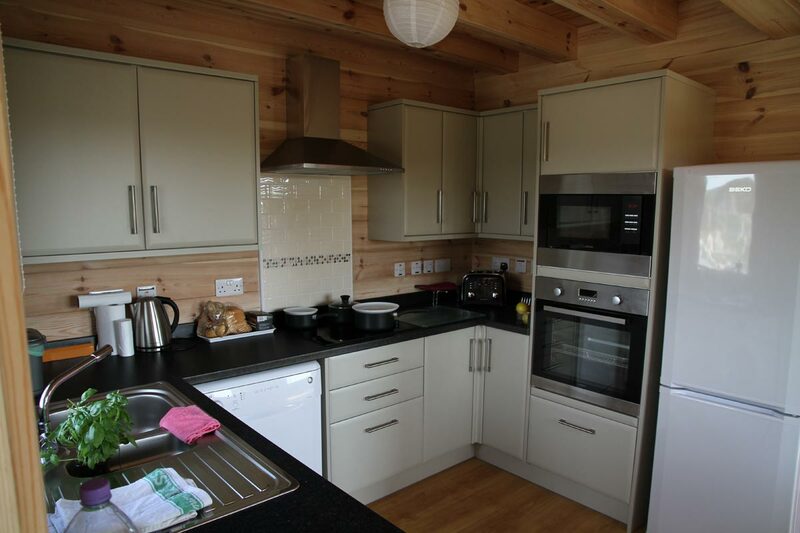 The kitchen contains: gas cooker, oil central heating, fridge, deep freeze, dishwasher and a utility room with washing machine. Sitting room with Sky Freeview television and gas fire. Dining room, well equipped kitchen with gas cooker, oil central heating, fridge, deep freeze and dishwasher; utility room with washing machine, five bedrooms – three twin bedrooms, two with shower and toilet en suite with an extra single bed, two double bedrooms one with shower and toilet en suite and one with wash hand basin. There is an extra bathroom with WC and also an extra WC. Linen is supplied, and a cot is available upon request. Broadband connection is available for personal laptops if required, please contact prior to arrival. There is ample car parking space in front of the house. No Pets allowed. Heating and electricity are included in the rent. 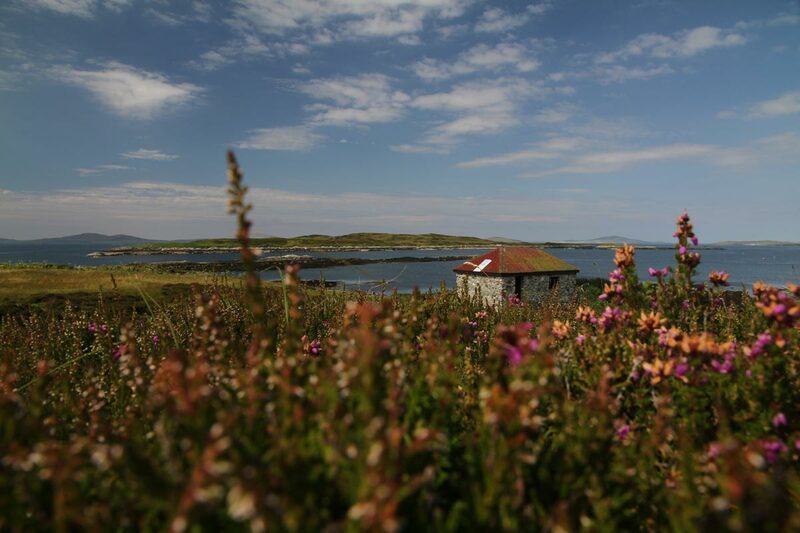 Visit the Church of Rodel which was founded in the 15th century, the wonderful sandy bays on the west coast, the Standing Stones of Callanish, the broch in Lewis or Lewis Bute of the North Cape. Book boat trips around the islands or even to the historical island of St Kilda in the west. Harris is the place where today the Harris Tweed is woven and the fabric and clothing are sold. Book tours to the islands online. You can go fishing in the nearby loch for salmon, sea trout and brown trout or you go for fishing on the sea. On the west coast, you can enjoy surfing, windsurfing, beachsailing or golfing. 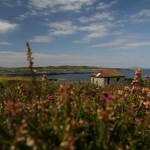 Take a bath in the sea or at the small loch above the fisherman’s cottage. In Harris and Lewis are very beautiful cycling ways. Take a walk on marked trails through nature or across the country through the impressive landscape and admire the beautiful view from the mountains. Book Sailing, Windcarting and Kayaking online. Harris and Lewis are well known for their bird life, particularly for the Golden Eagle and also for other species of Eagles. Watch the northern birds and migratory birds that you can see these times of the year. 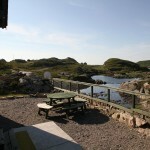 Enjoy the seals and otters playing in the sea directly in front of the houses. Many lochs are partially or completely surrounded by beautiful white water lily or water hyacinth. Book Deep Sea Fishing Tours online. Fishing is in the approximately 100 smaller and larger lochs and in the bays of Finsbay and Stockinish of 25 March to 31 October possible. (Fishing license required! Only at Loch Saile is fishing with fly or artificial lure for free). Sea fishing can be arranged. Brown trout fishing is allowed from the 25th of March until October. Best time for this is in the spring. The best time for Sea trout fishing is from June to late September. As of November, the spawning season begins. To fish Arctik Char is best from the 25th of March until October. Salmon fishing is best from early June to late October. The best months are July, August, September and October. Many of the higher lochs are very rarely fished, sometimes for many years not. Fishing in roation with two rods on each loch. All together 18 rods are possible. On loch Huamavat 6 rods and on loch rogavat 4 rods. Please note a weekly tariff of £ 30 is payable if Brown Trout fishing only is booked on the Finsbay lochs from 1st March to 31st May. No license is required for children and young people to the age of 15. Sunday is a day of rest. Fishing, especially for salmon and sea trout, is prohibited by law throughout Scotland. Only Fly Fishing is permitted using wet or dry fly and fly rod. The use of barbless hooks is appreciated, especially if you are releasing the fish you catch. Please handle the fish with great care, and if you are releasing them, make sure your hands are wet and that you do not squeeze the fish too hard. Fishing is permitted only from the shore or from a drifting boat. Thank you for your care and consideration. Only fly rods between 9 and 13 feet with an AFTM rating 6 – 11 are recommended, and floating lines with or without a sinking tip/sinking cast are suggested. Flies may be wet or dry and should be within the size range 4 – 16. Recommended patterns include Black Pennell, Connemara black, Ally’s Shrimp, black Shrimp, red Shrimp, Donegal blue, Muddler, Silver Stoat, Stoats tail, Munro Killer, Green Highlander, Greenwell’s Glory. It is difficult to obtain flies in Harris but we will try to help you if any are needed. A knotless landing net is required especially if you plan to release fish. The fishery does not employ a gillie, but a gillie is possible by arrangement as long as sufficient notice is given. Fish which are too small should be returned carefully to the water. Fishing hooks without barbs would be preferred. Single hooks till end of june. Single hooks whole year would be preferred. Sea trout under 1lb must be returned to the water (ca. 750gr ). Details of all catches must be reported to the fishery. Salmon must be released, all other fish caught belong to the angler. Accompanying dogs must be kept on a lead. Gates must be closed and fences must not be damaged. Each person is responsible for his or her own safety. From Monday 00 a.m. to Saturday 12 p.m. There are 20 Boats with oars at no charge. However there is an extra charge for a motor at £ 7 per day including petrol. Most boats can carry two anglers and a gillie. The disabled boat can carry three anglers and a gillie. A gillie and motor for the disabled boat is necessary. There is a boat on Loch Manish which can be used with oars. There are also rowing boats on Loch Dubha 1 and 2. Changes to these arrangements are possible, but you are requested to land boats only at the appointed places. All other lochs offer bank fishing only. The boats are normally situated at the outflow of the loch. On Loch Huamavat there are four boats. 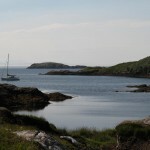 There are also boats on Loch Holmasaig and Loch Dempster, and a boat on the Sea pool of Abhainn na Ciste system and on Loch Meurach 2. One boat on Loch Malcolm and one on Loch Rogavat. Boats are to land only at the appointed places. Changes to these arrangements are possible on request. Safety measures must be observed at all times. These are supplied with the boat and should be requested when obtaining your fishing permit. The fishery is in no way responsible for the welfare of the anglers and gillies, who should provide themselves with lifejackets or other safety equipment and must judge unfavourable weather conditions for themselves. comprise about 50 lochs of a variety of sizes with two separate tributaries leading down to the sea. Some of the lochs are near the road, most can be reached within 30 minutes, and the most distant are within an hour’s walk. There is a system of daily rotation. includes the Sea pool beside the old Lodge (now demolished). The fishing Hut is also situated there. Other lochs include Loch Holmasaig, on the opposite side of the road. This is connected by a burn to Loch Dempster, which is the first true freshwater loch in the system. Continuing upstream the small stream at the end of Loch Holmasaig, for 20 minutes brings you to Loch Dubha 2 and then on the left hand side, Loch Dubha 1. There are boats on all these lochs. The latter two are normally fished by those with a Flodabay permit. 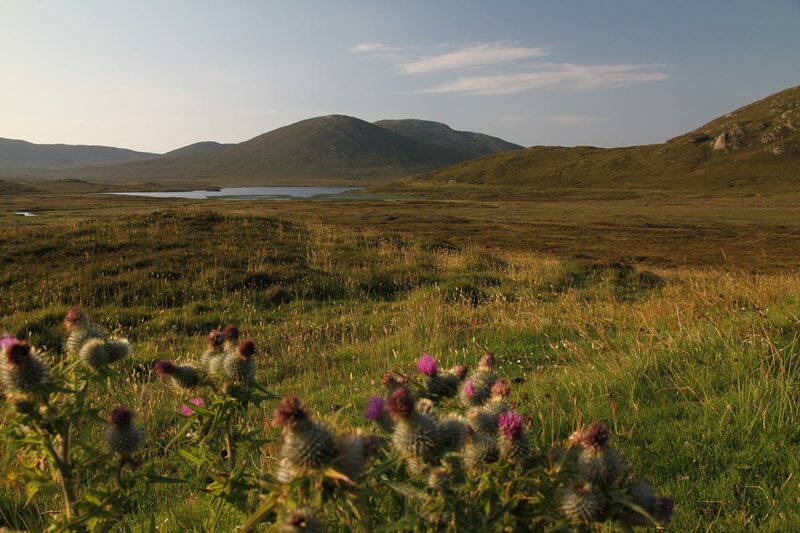 The longish Loch Fin can be found about half way up and on the right hand side of Loch Dubha 2. 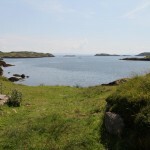 If you continue on from the end of Loch Fin and in the direction of the hills, you will reach Loch Rogavat. This is a fairly sizeable loch, all of which is fishable. From the fishing hut on the way to Manish (about 1 mile), you will find the Huamavat system’s largest loch, Loch Huamavat. Here there are 3 boats, one of which has easy access to the front and is especially suitable for disabled fishers. 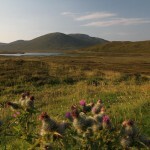 If you continue from the end of Huamavat up the burn for a short distance, you will reach Loch Malcolm and beyond that Loch Cross. Then, carrying on up the burn, you will find other Hill lochs which can be fished: Loch Curtains and Loch Robert on the left and Loch Uamh nan Cnaimh and an unnamed loch on the right. Going still further in the direction of the hills and veering towards the left, you will reach Loch Rogavat. starts with a nice Seapool, five minutes walk from the fishing hut and in the direction of Rodel, and at the end of which there is another good pool. There is a boat by the road. There is a strong drift towards the sea when the tide changes, so please take great care. There are two ways of reaching the other lochs. One (which is the longer way) is to follow the burn on foot upstream. The other is to drive up to the signpost on the road to Leverburgh marked Loch Meurach 1 and 2. From here, it is five minutes walk, you will find Loch Meurach 1 and then a further five minutes to Loch Meurach 2, the larger of the two lochs. 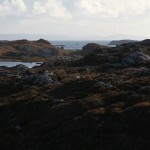 There is a boat at the right hand corner of loch Meurach. A further five minute walk, will take you to Loch Clachain. When the water is high, there is a fine waterfall and a good pool at the seaward end of this loch. The intervening lochs along the line of the burn can also be fished – Loch Duncan, Loch James, Loch Sandy and Loch Alistair. 10 Rods. SALMON, SEATROUT, BROWN TROUT. consist of in the region of 35 lochs, both large and small, and again with two separate tributaries to the sea. Most of these lochs can be reached on foot in less then 10 Minutes. The furthermost of the lochs is approximately 45 minutes’ walk, but is not part of the daily rotation system. 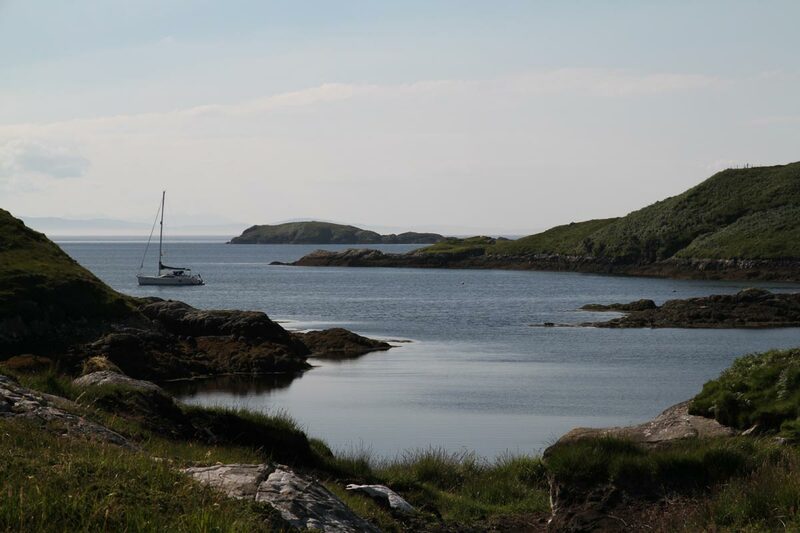 Included in the Flodabay system are Loch Cairistiona together with a group of five other small lochs plus Loch Braigh, Loch Dubha 1 and 2.
of the Flodabay Fishing is called Manish system. Its main feature is the small Loch Vanish , which is located behind Nurse’s Cottage and can be reached on foot in about 5 minutes. If you follow the small stream which flows into Flodabay it will also take you will to Loch Vanish. On the hillside end of Loch Vanish, there is another stream, and if you keep on along this you will come after 5 minutes to Loch Manish. In the middle of Loch Manish there is a spit, where the boat is kept. The two lochs are fished on a rotation system known as „Number 1“ (FL 4 & FL 8) and they are fished in combination. of the Flodabay Fishing is called the Flodabay system. 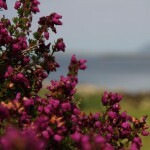 It flows into Loch Flodabay (the sea loch) 5 minutes’ walk from Nurse’s Cottages. Loch Flodabay with „Number 3“ (FL 9) is adjacent to the road. It is also the third loch in the rotation system, and the walk to the end of the loch takes about 10 minutes. Please keep to the right side of the loch if you are fishing from the bank or if you are on your way to Loch na Creige Briste, which is the „Number 2“ (FL 12) in the rotation system. Where the stream forks, keep to the left and please take care not do damage trees or fences. Loch Number 2 is approximately 25 minutes from the road. The deeper parts of the stream can also be fished. 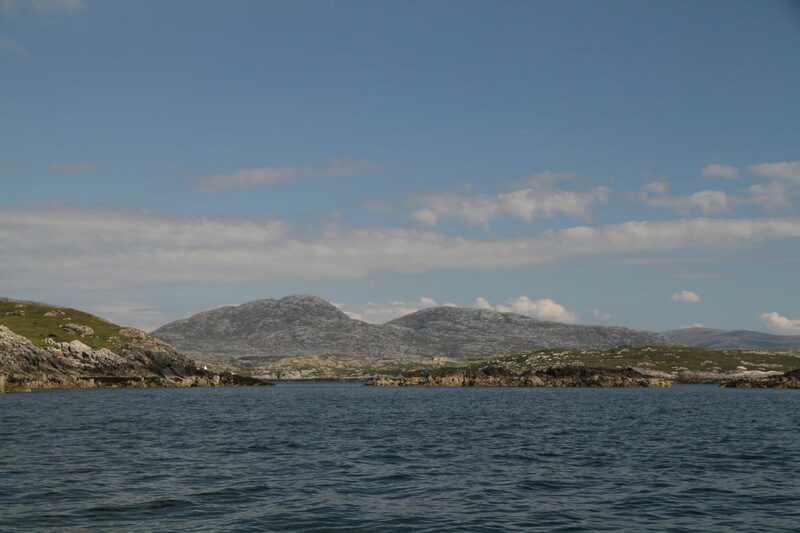 Loch Dornail „Number 4“ (FL 22) and Loch Tarbert „Number 5″(FL 21) in the rotation system respectively, are 500 metres further south on a small hill and are marked by a sign. Please take care not do damage to the water pipe which leads from Loch Dornail. 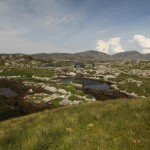 There are further lochs not in the rotation system which belong to the biggest loch „Number 6“ (FL 16) Druim nan Staoin. These are approximately 45 minutes on foot from the road and are approached by walking straight up the hill and beyond Loch Dornail. 500 metres further south, between the road and the hill, there are six small lochs known as Lochs Cairistiona „Number 8″(FL 23, H 9, H 10, H11, H12, H13). The first of these is just behind the road. On the opposite side of the road towards the sea there is another small group of lochs known as Loch Braigh „Number 7“ (FL 24, FL 25, FL 26). Another 1000 metres further on and just before the cattle-grid, turn right towards Loch Dubha 1 (A 30 ) and 2 (A 31). If you then face away from the sea on the right hand side of Loch Holmasaig and follow the small stream towards the hill an beyond Loch Holmasaig, you will come after a 20 minutes’ walk to Loch Dubha 2 and after that to Loch Dubha 1, collectively known as „Number 9“ (A 30 & A 31) in the Flodabay fishing’s. Other lochs may only be fished with a permit from Finsbay Fishing’s. 5 Rods. SEATROUT, BROWN TROUT, possibly SALMON. 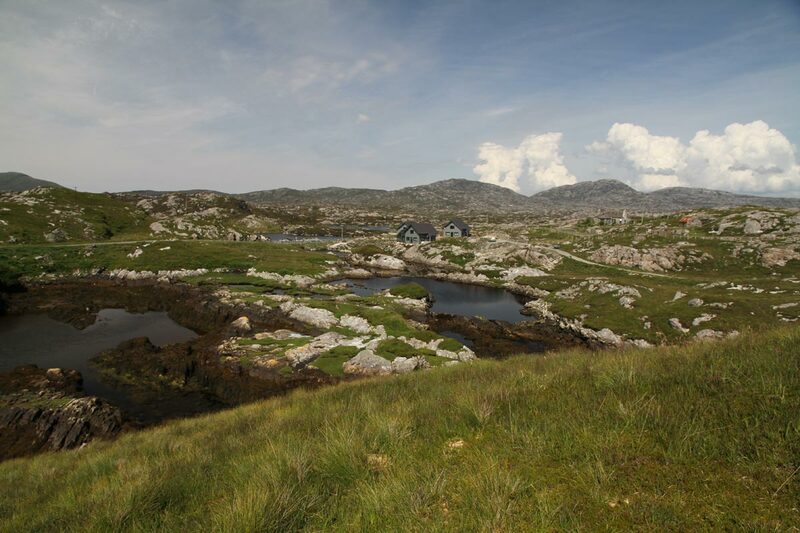 comprise about 15 lochs all of different sizes, and again there are two separate tributaries leading down to the sea. Some of the lochs are close to the road while the furthest is 20 minutes walk. An old road provides easy access, and again there is a system of daily rotation. 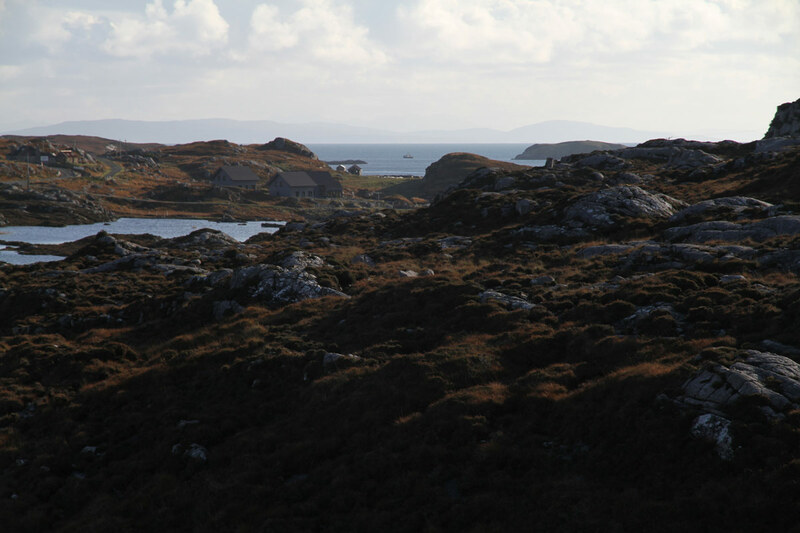 of the Stockinish Fishing is called the Leakalee system, and it starts on the hill side of the A859, the main road to the west coast of South Harris, where the road to Rodel crosses. The area can be identified by a large electric power station. The name of the first loch on the hill side, is Loch nan Learg, which is 10 minutes walk away, while Loch Srath Steachran is 300 metres along the A859 towards the west coast, below the road. These lochs may only be fished from the bank, but there is a boat at Loch Glumra Beag. 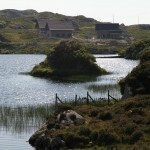 To reach Loch Glumra Beag, take the road towards Rodel, drive past the power station and you will shortly reach Loch Airigh lain Oig on the left hand side. Further down the road you will find a bridge near the sea, which is where the Leakalee system’s Seapool is located. A few metres before the bridge, there is a path heading towards the hill. Follow the path, and in 5 minutes you will come to Loch Glumra Beag, and a boat. Please take care not do damages the fences and to close all gates as you go through them. Loch Glumra More, a narrow, longish loch, connects to the middle of Loch Glumra Beag on the left hand side. 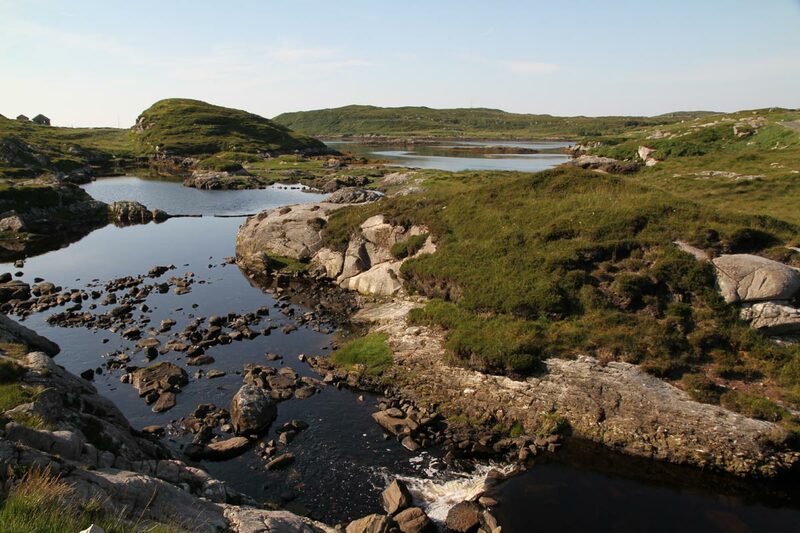 If you fish up the burn on the right of Loch Glumra Beag, you will come to Loch Chnoic Mhoir. 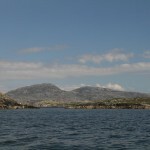 of the Stockinish Fishing is called Creavat system, and it is further along the road towards Rodel. The fishing starts behind the next bridge, where there is a small private road going down in the direction to the hill. On the left, where the road begins, you will see Loch Saile, which is a tidal loch and can also be fished. Fly fishing for Sea trout is also possible in the estuaries. Follow the private road until you come to a nice cottage. If you are walking to Loch Creavat you can park your car there, but please take care not to disturb anybody, especially the owner of the cottage. Take the path or follow the line of the stream up and in 10 minutes you will reach a small unnamed Loch and 5 minutes later Loch Creavat. 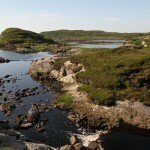 The pools in the burn and the small Loch can be fished, and there is a boat on the Loch Creavat. At the present both above systems hold Seatrout and Brown Trout. 1997 Grilse. If you drive from Cliff Cottage in direction of Tarbert, it will take you about 5 to 10 minutes to get to System 2 of the Stockinish System. 5 Rods. BROWN TROUT, SEATROUT, possibly SALMON. It is only possible to travel to Harris on 6 days of the week by ferry as there are no sailings on a Sunday. There are limited air flights, but please check with the operator. 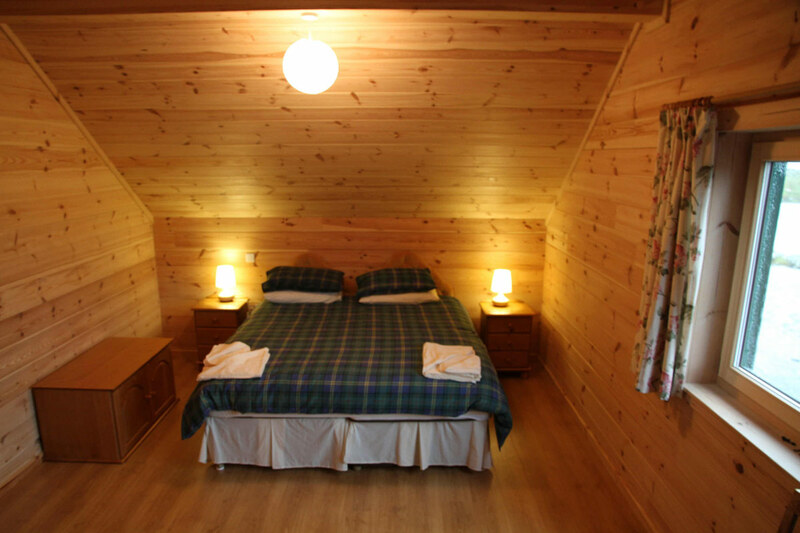 Cottage and Lodge bookings can therefore only be made from Saturday to Saturday. Ask however for details of short breaks. To reach Harris by air, one should go via Glasgow or Inverness to Stornoway. There are usually two planes daily to and from Stornoway. Reservations for flights anywhere within the UK can be made by telephoning British Airways Phone: (0345) (1) 222111, and a car hire can be reserved at Stornoway Car Hire MacKinnon drive Phone: (01851) 702984. There are three car ferries to the island. The first goes from Uig on the Isle of Skye to Tarbert in Harris (a journey of about 11/2 hours) and the second from Ullapool on the mainland of Scotland to Stornoway (taking about 21/2 hours) and third from Uig to Lochmaddy in North Uist and from North Uist to Leverburgh/Harris. Enquiries and reservations for these ferries can be obtained from: Caledonian MacBrayne Ltd, Car Ferry Reservations Phone: (0990) 650000, Fax: (01475) 635235. The Ferry Terminal Gourock, Scotland, PA19 1QP. Phone: (01475) 650110, Fax: (01475) 637607. Please ensure you book the ferry journey prior to travelling as especially in the summer the ferry can be busy. There are buses to and from Glasgow and Inverness and from there to Uig and Ullapool, and a train service from Inverness to Kyle of Lochalsh which is just across the water from the Isle of Skye. On arrival, take the A859 road going southwards for about 5 miles until you see a turn-off to your left, signposted Geocrab, Manish, Finsbay and Roghdal. Travel along this road through Geocrab and Manish, and after about 3 miles beyond Manish, and just before you reach the village of Finsbay, you will a sign pointing to Quidinish Gallery. The three cottages are on your left, a very short distance on the main road beyond this sign. 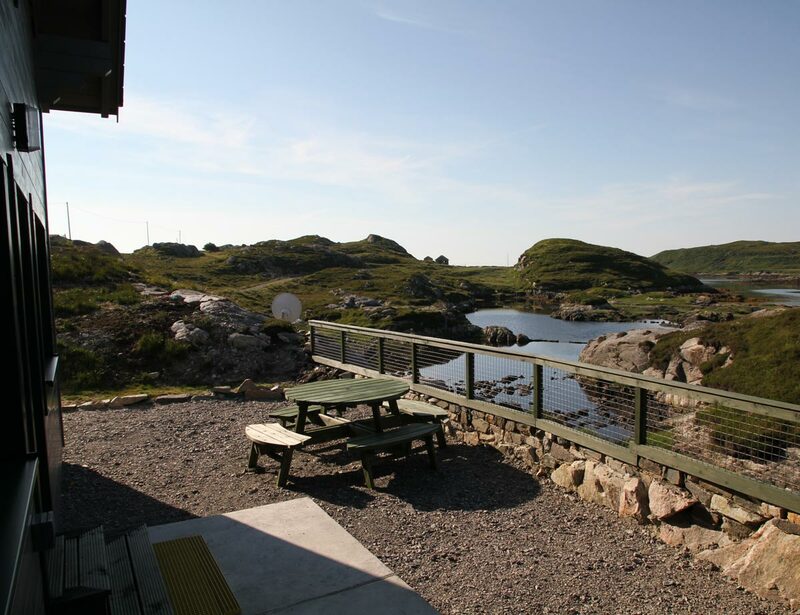 The nearest town is Tarbert which is also the ferry terminal. The Clachan at Leverburgh where you can also get petrol is about 6 miles away, A D Monro, Mini-Market Tarbert about 12 miles distance and there is J Morrisons, Mini-Market, in Tarbert. 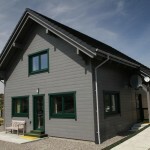 There is also Harris Outdoor Adventure Centre in Leverburgh for the hire of kayaks, bicycles and trips to sea. There is a coin – operated telephone in Two Water Lodge. However no telephone is available at Cliff Cottage. There is good reception on the island by Vodafone, but other networks are intermittent. 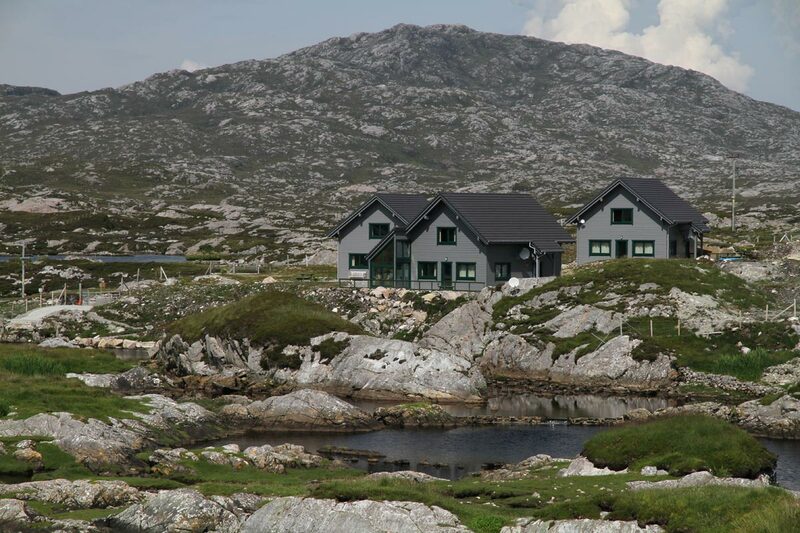 Finsbay Lodge Houses and Two Water Lodge electricity and heating is included in the rent. 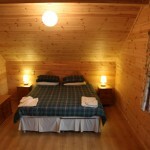 At Cliff Cottage there is a charge of 20p/Kw from beginning of October until the end of March. If any of the appliances in the cottage should not be in good working order, please report this and that repairs can be carried out. Sheep often and suddenly change the side of the road. There are only a few effective fences. In Great Britain drive on the left!